You are currently browsing articles tagged versailles. To get to Château de Versailles from Paris by bus, the first step is reaching the bus terminal at Pont de Sèvres Metro station, which is the terminus (last) station of Metro Line 9.
i) Getting to Pont de Sèvres (Metro line 9, direction Pont de Sèvres). Metro line 9 has many transfer points and makes Pont de Sèvres bus terminal easy to reach. You’ll take Metro line 9, direction Pont de Sèvres, to the final end station, i.e Pont de Sèvres. Upon arrival (follow the crowd and) walk to the adjoining bus terminal at ground level, which will be clearly marked within the Metro (usually by a blue circle with “BUS” inside). You can also follow red coloured Bus 171 signs within the Metro which will lead you up to ground level. 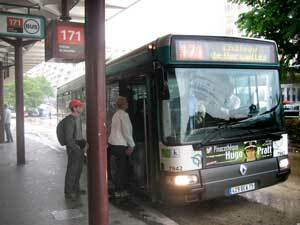 ii) At the Bus Station there are more than a dozen buses, but the bus you need to take is Bus 171. Above is a photo of its departure at Pont de Sevres bus terminal and Chateau de Versailles is its last stop. The journey is roughly 30 minutes. The price for the trip from Paris to Versailles depends on whether you began the journey on Metro or directly at Pont de Sèvres bus station. If using regular Metro/Bus tickets (which are same type of tickets: Paris Metro Ticket T+) you’ll need two tickets with total cost of , one way (price valid ). 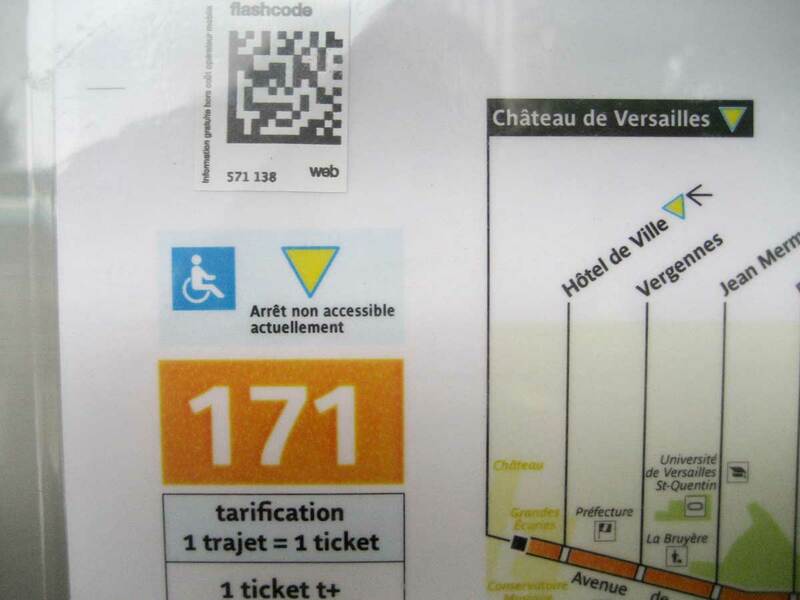 One ticket will be used for the Metro to Pont de Sèvres and another ticket for Bus 171 from Pont de Sèvres to Versailles, which is in Zone 4 and the Metro only covers Zones 1-2. Keep in mind that tickets purchased directly from the bus driver will cost instead of so you may wish to purchase tickets from Metro ticket vending machines or from ticket windows prior to boarding the bus. Side note: Regular Metro tickets, once used for the Metro, are never valid for transfers onto buses. Transfers from Metro to RER trains are permitted, as are transfers from bus to bus, but you cannot transfer from Metro/RER trains to buses or vice versa using the same Paris Metro ticket. To complicate things a bit further, bus tickets purchased on board buses… are not valid for transfer, even from bus to bus and cost more, vs. . If you are within walking distance to the bus station, you’ll only need one Metro/Bus Ticket T+ for the bus ride . As noted above, try to purchase a ticket before you arrive at the bus, since the driver will charge you if buying on board. (Note: a carnet or booklet of single-use Paris bus/Metro tickets can be purchased at a slight discount, and it makes sense if you’ll be traveling to other places as the tickets are used for all forms of transportation within the city of Paris. See Paris Metro Tickets for more details). Zone 1-4 day passes good for Metro, train, bus (Ticket Mobilis) and Zone 1-4 Navigo week passes are valid for travel to Versailles. 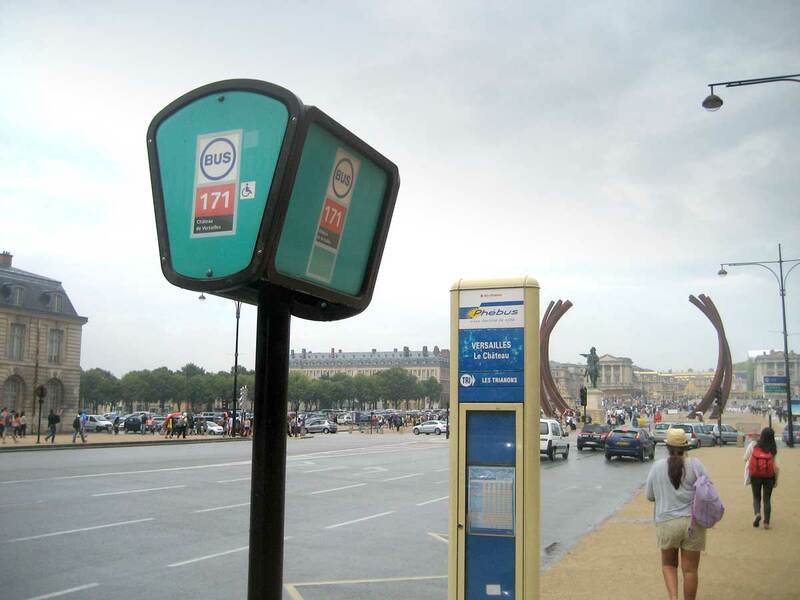 For Ticket Mobilis, which is actually a paper ticket, insert the ticket into the ticket reader/validator next to the driver, about the size of a tissue box, attached lengthwise vertically from a pole. The machine should light-up a green rectangle confirming the ticket is valid. For Navigo cards, simply hold the pass against the purple part of the ticket reader/validator to validate your pass has the correct zones purchased. To return from Versailles to Paris by bus you’ll need to take Bus 171 from the stop on the opposite side of the street from your arrival on Bus 171. It should be the first bus stop you encounter when walking directly back from Chateau de Versailles along Avenue de Paris. Here’s a Google Map view with the bus actually at the stop. Locate either train stations or metro stations in central Paris that will connect you to RER C, the yellow RER line. Listed below in the flowchart are all the RER C stations within Zone 1, their arrondissements and any connecting metro lines (ie. if you are closer to a metro station, you can hop onto any of the listed metro lines to get to the specific RER station). All RER lines fork and have several different end terminals, so you’ll have to pay attention to make sure that you’re on the right train. The terminus station to get to Château de Versailles is ‘Versailles Rive Gauche’ (listed as C5 on the RER map). Between central Paris and Versailles, you need to take the RER C Line in a way which will lead you to ‘Javel’ station and later to ‘Porchefontaine’ station. Since the line forks, it will really depend on where you start to know how many stations away Javel and Porchefontaine will be. These stations will indicate whether you’re heading in the right direction to end up at ‘Versailles Rive Gauche’. Example: If you start at Avenue Henri Martin, you’ll need to pass Boulainvilliers, Avenue du President Kennedy and then Javel, if instead of passing Javel you hit Champ de Mars it means you’re going the wrong direction. This is an easy mistake to make and if that happens, just get off at the station and look for the signs in the station which go towards the right direction. Make sure not to exit the station or else you’ll need to use a new ticket over a common mistake. 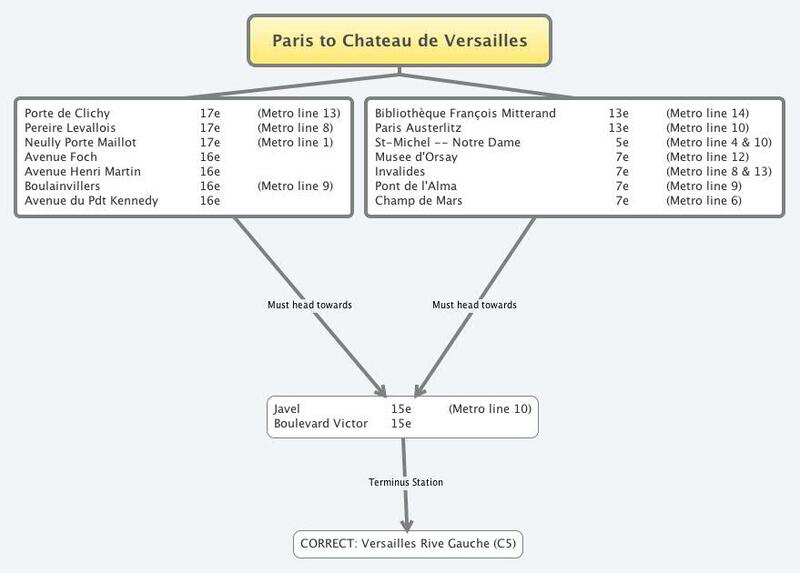 Once you arrive at ‘Versailles Rive Gauche’, Château de Versailles will take about five minutes to walk to. Ticket t+ cannot be used for this trip. Versailles is within the Île-de-France region. The ticket t+ is only valid on RERs within the city of Paris (ie. Zone 1). Instead you’ll have to get a ‘Billet Origine-Destination‘ to/from Versailles-Rive-Gauche at 4,10€ per direction (price current as of January 2013). Note: If you plan to use any other forms of public transportation in the day, I recommend getting an unlimited Mobilis pass for the day from Zone 1-4; you’d only need to take one more round trip to make it worthwhile in terms of cost (pass costs 10,85€). During normal working hours, ‘Versaille Rive Gauche’ station has someone selling tickets who may speak a bit of English. Be prepared for the language barrier by having a map handy and the places you need to get to written down. Otherwise, happy traveling! Getting to the station from Château de Versailles is just as easy, there’s clear signage to help you navigate back to the train station and then hop onto the RER C line to Paris and you’re set. If you’re feeling adventurous, you can always take the bus back too! For more information, check out the ParisByTrain article: Château de Versailles by Bus.